The most powerful RPN graphing calculator available. With the HP 48GX, you can take on the toughest equations from the classroom or lab and make sense of them. And since its memory and functions are expandable with plug-in cards, the possibilities are virtually endless. Customizable with plug-in cards. Expand the HP 48GX’s memory from 128KB up to 1280 KB, or select from a wealth of third-party applications. Built-in equation library. More than 300 scientific and engineering equations. Object-oriented programming. Create applications quickly and easily. HP MatrixWriter application. View, enter and manipulate arrays. HP EquationWriter application. View equations and formulas just as you would in a textbook or on paper. HP Solve application. Solve for any variable without rewriting your equation. Infrared Communications. 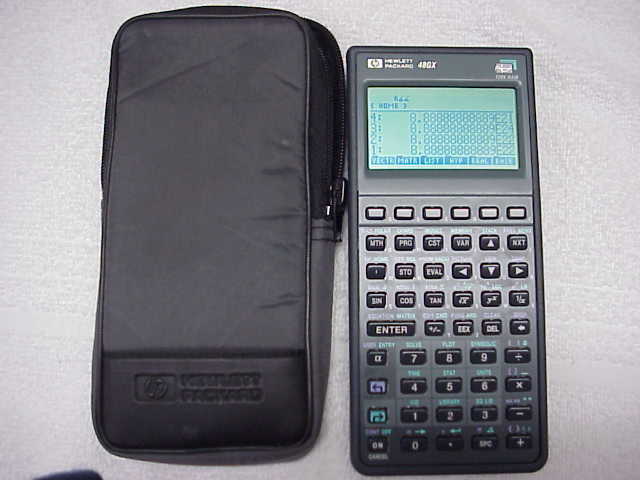 Send files between HP 48G/GX calculators, and to the infrared printer (optional). Connect to your Mac or PC with an optional connectivity kit. The 48G and the 48GX offer the additional features of: 2D/3D plotting and graphics; algebra, quadratic and polynomial. Calculus, symbolic, numeric, integration, and differentiation; business features; constants and equations. The 48GX has expansion capabilities two slots for multiple applications and up to 1280 KB of memory.